FITBIT still rocks a great product. OK, the band on my "new" CHARGE, which replaced the one I sent back a year ago stretched out again recently, after a year. I don't wear it in shower or get it wet or abuse it. So, I guess the bands are bound to stretch out and lose the shape. However, this Charge is still working well and I'll deal with little stretching around the face of it .. . I rely on it for steps, call alerts, time, alarms, etc .. and it keeps me in shape .. wanting to do at least a mile a day .. I know -- I do more .. but let's say, there are days which if I am honest, I am writing and not doing over 6,000 steps .. There is a CHARGE which measure HR (heart rate) and I am sure it has the same band problem. I haven't heard or read about any complaints . The ALTA seems to a nice upgrade in that they must have noticed the bands were flimsy and went ahead and made inter changeable bands. So, you won't have to worry about that problem. The mechanism works without a hitch really. I got a good look at the BLAZE and it's probably going to be my next purchase when the price goes down .. It's around $189 .. already down from $229 .. It's got a nice sophisticated look in the form of a watch .. and it looks like my next purchase .. even though there are so many others out there competing .. These days I count on Customer Service and the way corporate treats their customers. FITBIT has filled that requirement. And, after 2 years, I am still not tired of tracking my day. My story below was and is still true. I will stick with Fitbit. You can find similar version under "community news," on the Fitbit website. t have followed most of the rules to keep my Charge in good working order. --- keep it clean for one and out of water. . Learn how to optimize all the features. Nothing wrong with the mechanism, however, my band warped before the warranty was up after about 9 months. I was pleased that when I called and asked for instructions on how to "fix" the band, they said they would just send me a new Fitbit Charge. I thought that perhaps the extreme heat while on vacation in Florida may have done it, but, whatever it was.. I may have gotten it wet at some point at the beach ... no explanations needed as they honored the one year warranty. .. I'm glad the customer service team was helpful and sent me the new one. I'm not worried about sleeping wth it or exercising with it... it's a baby bear. .. Honestly, it really keeps its promises .. tracks sleep pattern with good accuracy. Occasionally I have to sync it again, and, or, get notifications back on, but, it's a small price to pay for working on fitness goals. By using all the features -- tracking your daily activities, you'll appreciate all you really do (or don't do) every day. Follow how to learn to get the most out of it .. on the site for one and the instructions, of course. 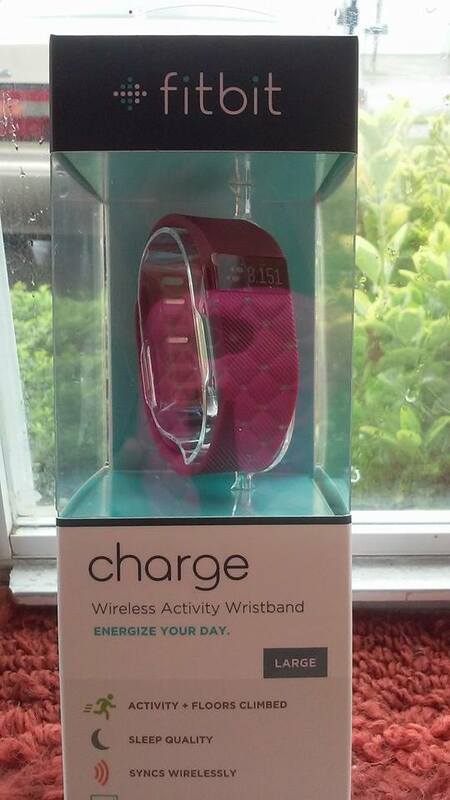 Fitbit Charge -- Burgundy has pink OLED (organic light emitting Diode) .